Almost two decades back, internet was just a rising tool. During the time when internet was spreading its legs in India, many people did not have it, in fact that time mostly people did not use it. Entrepreneurs did not think to use it as a tool to boost their businesses over the web. But now in last couple of years, it has seen a rapid change as not juts entrepreneurs but all type of users are spending maximum of their time over the web to explore their desired things. Among all these connection, users always get confused to find the right connection as per their need and requirement. In case, you want to get the latest and one of the unique connections for your home or business, optical fiber connection or fiber to the home (FTTH) is the best connection for you. Speed is something that every user looks for in today’s time. If a connection does not have a good and steady speed then it makes users annoyed and forces them to switch to other service operators in view to get best speed. Therefore it is always good for users to find the best broadband service provider in their locale for smooth and hassle free web browsing experience. Understanding the need of the hour and actual demand of the users, TriplePlay strives to bring best data plans with unmatchable speed. Why to Use TriplePlay over Others? There is always a question in the mind of the users, “why to choose any particular service provider over others?” as everyone claims to offer best service in best price. Yes, we at TriplePlay completely agree with you that all the internet service providers in Delhi or anywhere in India claim to offer best services than others, but actually it is an attempt to attract the users and trap them in their enticing offers so that they can get a connection. In case you stay in Delhi-NCR, we at TriplePlay want you to try all the service providers and then judge which the best broadband service provider in Delhi or Gurgaon (Gurugram) is in terms of speed and connectivity. Unlike others, TriplePlay does not make false claims rather believe in customer satisfaction by providing them speed like never before. It is not that others connections don’t have these features, but there is always an issue of connectivity and speed with them. 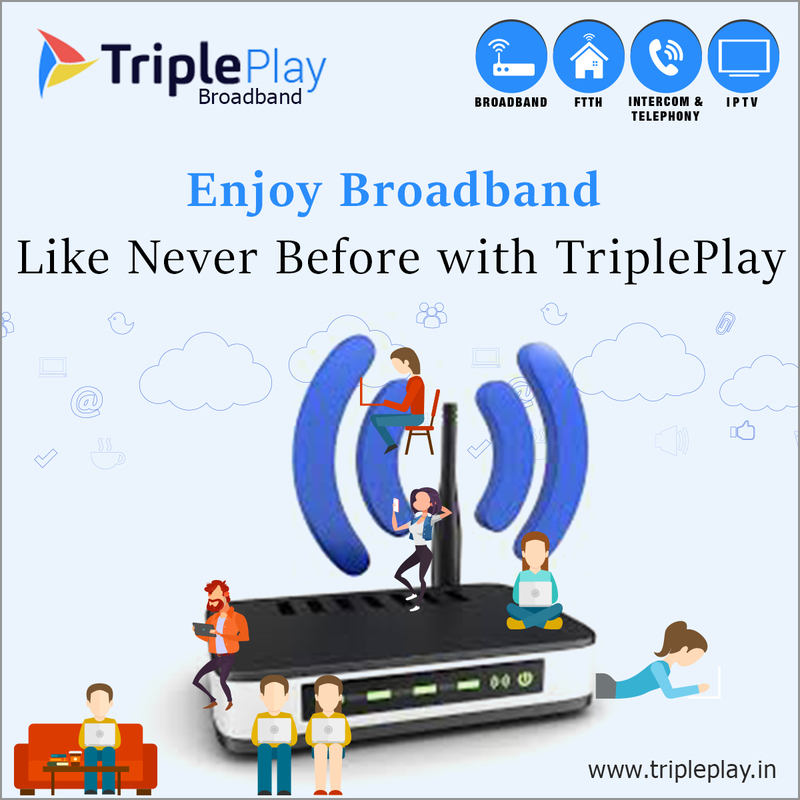 TriplePlay strives to work out on these issues and adopts the latest technology (Optical Fiber) to provide ultra fast speed with strong connectivity which allows users to do multiple tasks without the issue of slow connection. So get a connection now and enjoy web browsing like never before!